I recently took on two challenges in the sphere of political and cultural advocacy: understanding the roots of our democracy and national laws, and learning to engage in meaningful debate based on this historical knowledge. We often cite the phrase, “To know where you’re going, you’ve got to know where you’ve been.” Yet we rarely seem to apply this standard to our political and legislative systems. Sankofa: "Go Back and Get It"
Earlier in May, I had the strange yet invigorating opportunity to engage with a “major player” in the House of Representatives, and one of their legislative aides. During the conversation with the aide, we had what I would call a semi-spirited debate on the validity and accuracy of my use of the phrase “legislative lip service” in referring to a recent piece of legislation related to the passage of the American Health Care Act of 2017 (AHCA). The aide insisted that Congress and our nation’s legislative bodies never pass legislation that, as I argued, either does not mean what on its surface it appears to mean or does not do what on its surface it appears to do. I argued that such legislation diminishes the good faith of the American people, and leads to confusion and distrust of our legislative leaders. The aide, amid a short “yes it does—no it doesn’t” back and forth, finally “challenged” me to provide “any” legislation that historically did either of the things I argued. I’ll share the response I gave with you. “We hold these truths to be self-evident, that all men are created equal …” From the time this phrase was first penned, it has been argued, as by Jack P. Greene in his 1976 text and inaugural lecture borrowing its title from the phrase, that perhaps “no single phrase from the Revolutionary era has had such continuing importance in American public life as [this] dictum.” And yet, even as a phrase so integral to the framework of American democracy that it worked its way into numerous state constitutions, it is one of America’s great contradictions. Numerous figures both contemporary and historical point to the hypocrisy of a Declaration phrase penned by men who themselves owned slaves. The hypocrisy, in fact, became so evident that it became a key element in the arguments of the Quock Walker cases that effectively abolished slavery in Massachusetts. Today, many are familiar with the lyric from Lin Manuel Miranda’s award winning Hamilton musical, sung by Angelica Schuyler: “We hold these truths to be self-evident / That all men are created equal / And when I meet Thomas Jefferson / I’m ‘a compel him to include women in the sequel!” A fundamental document in the historical scaffolds of our nation penned equality on the page yet denied it to two key groups (at least) in practice. This, I argued with the legislative aide, arguable wrote legislative lip service into the democratic framework of our legislative systems. “It freed the slaves,” answered the aide. He seemed almost grateful for the soft ball, adding that it was a “great example” of the power of the American government to make positive change for its people through legislative action. I encouraged the aide to do just what he suggested he would: go back and read the text, among others. And through this recommendation, I came to the true crux of the matter. We cannot know where we are going, as individuals or a nation, unless we are willing to critically look at where we have been. This idea is captured beautifully in the word Sankofa. 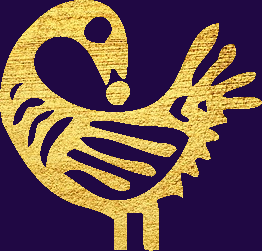 Sankofa is a Ghanaian phrase and symbol (adinkra) that translates, “Go back and get it.” In essence, it means that as we move forward and learn as time passes, we must never forget the past that has paved the path for this progress. And yet, in our society, we too frequently seem to put blinders on when it comes to the past. History seems to sneak up on us as it repeats itself. From the modern civil rights battles of the LGBTQIA community that call forward the memory and legacy of the 1960’s racial civil rights struggles, to the actions of the current administration that for many harken back to the Nixon era, we seem to see yet struggle against the parallels between the present and our past. We forget that historical battles are cyclical, mirrored through time, reflected through a lens that has seen this all before. We forget that America has always been “the great experiment,” and so forget that experiments always—always—rely on repetition: we try, we succeed or fail, and we go back to try the process again with new variables. It worries me that legislative aides, and legislators, at the seeming top of our governmental hierarchy can so easily fail to see, refuse to see, or simply dismiss, the history we draw from to move forward as a country. As I shared with him, an easily forgotten past only leads to turmoil in our present society. A government that does not look back toward the full history that has led to its current point of action, or look forward toward the history its actions will create, is not acting in the interest of its people. And a government that denies history creates distrust and fear among the people. And government cannot thrive when the state of the union is fear. It worries me that even among those of us who advocate for change we seem to more frequently lose sight of the lessons of the past that could make or break the revolutionary actions we fight for. We, too, bear great responsibility to the past. It both shapes us, and is shaped by us into progress. Just as the legacy laid down by my forebears has paved my developmental path, we as a nation owe it to our own history to never forget where we came from. We owe it to our past as much as we owe it to our future … because one cannot live without the other. As we move forward, as we fight our great fights and struggle toward the ever more perfect union, let us remember to go back, fetch the lessons we have left in the past, and bring them forward to our present, to better craft our future. Se wo were fi na wosankofa a yenkyi ... It is not wrong to go back for that which you have forgotten. Want to stay connected? I invite you to connect with me on Twitter, Facebook, Instagram, and LinkedIn.